Each month, West Orange - Cove CISD is pleased to recognize a Student of the Month. Students are selected by their campus and presented with a Certificate of Achievement in front of the WOCCISD Board of Trustees. Recognitions are made by the individual campus principal and Superintendent Rickie Harris. 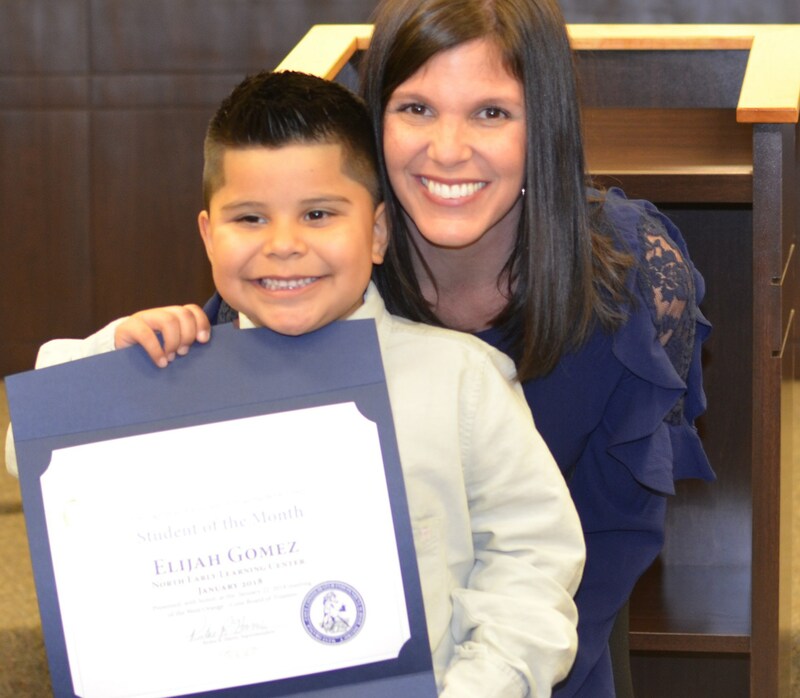 January 2018: North Early Learning Center's Elijah Gomez is the District's Student of the Month for January. Elijah is very well mannered, kind to everyone, and very helpful. He is also always eager to learn! Congratulations! He is pictured with his Vickie Price, his campus principal. November 2017: Congratulations to West Orange - Stark Elementary fourth grade student Alyssa King! She was recognized as our Student of the Month at the November meeting of the WOC School Board. Alyssa works hard in all of her classes and has a positive attitude. She is a wonderful young lady and always has a smile to share. Alyssa was nominated by several teachers. 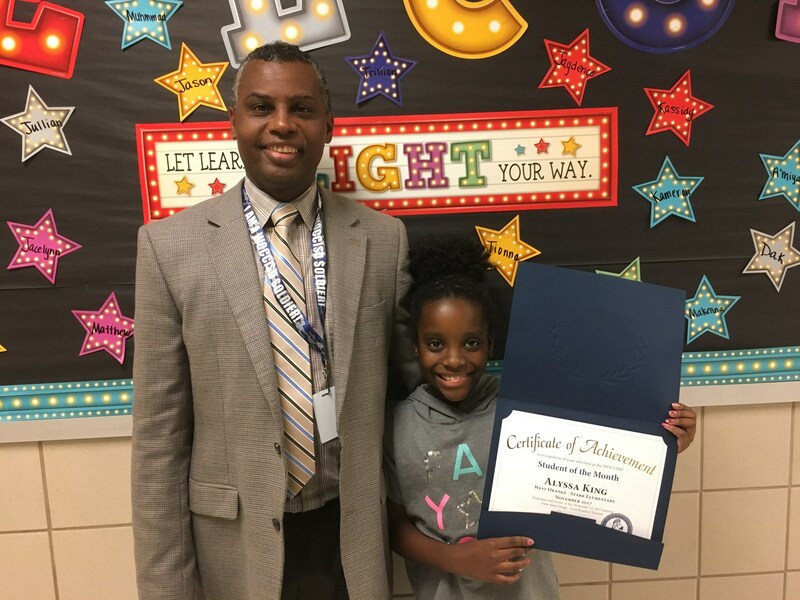 She is pictured with her principal, Dr. Troy Bethley. May 2017: Congratulations to West Orange - Stark High School's Cody Dunaway! He is the West Orange - Cove CISD Student of the Month for May. He is an outstanding student who always gives 112 percent! 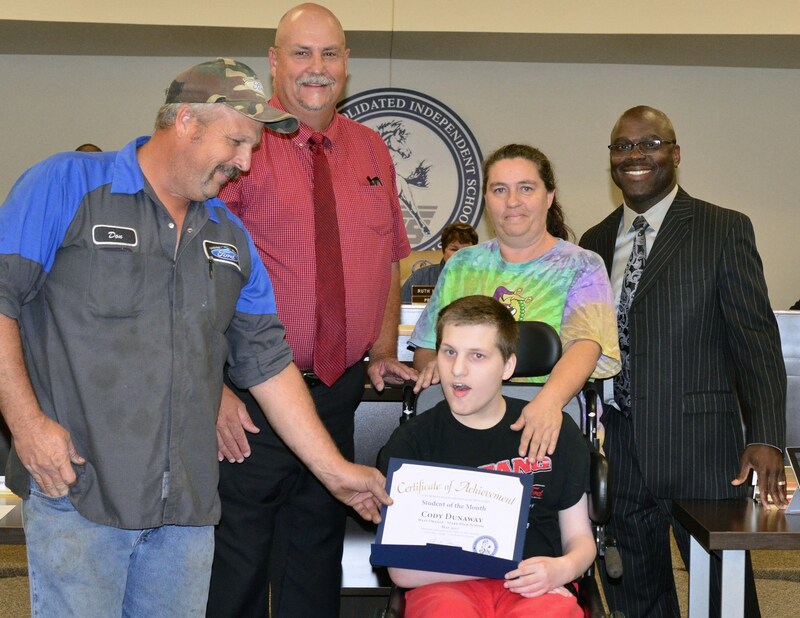 He was presented with the award at the WOCCISD School Board Meeting held at the end of May. He is pictured with WOS High School Principal Rod Anderson, his parents, and WOCCISD Superintendent Rickie Harris. April 2017: Jordyn Hooper, a North Early Learning Center student, is the WOCCISD Student of the Month. She is always eager to learn new concepts. Jordyn is always willing to help her friends and teachers anytime asked. She is very sweet and wants to make her friends happy. 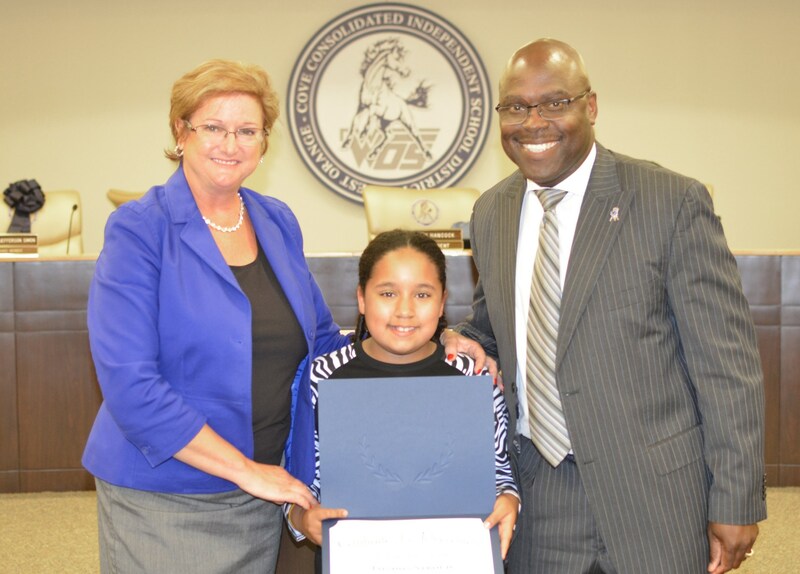 She is pictured with her Principal Sherry Hardin and Superintendent Rickie Harris. March 2017: London Stroud is the West Orange - Cove CISD Student of the Month. London is an exceptional 4th grade student at West Orange - Stark Elementary. She is a member of the very first group inducted into our newly-formed chapter of the National Elementary Honor Society. London is a Mustang through and through, and brings her shining light and spirit to the hallways of WOSE every day. You will always see her smiling! She is pictured with Principal Glenetta Henley and Superintendent Rickie Harris. Photo not available. February 2017: Congratulations to West Orange - Stark Middle School student Drayden Bradberry! He was honored at this week's meeting of the Board of Trustees. WOS Middle School Principal Dr. Anthony Moten said, Drayden is an outstanding student, with a great smile, and personality to match. He is also always willing to help. Congratulations, Drayden! January 2017: Yunique Lofton is a the WOCCISD Student of the Month for January. Congratulations!! She is a student at North Early Learning Center. She is a class leader, helps her classmates, and is always eager to learn. 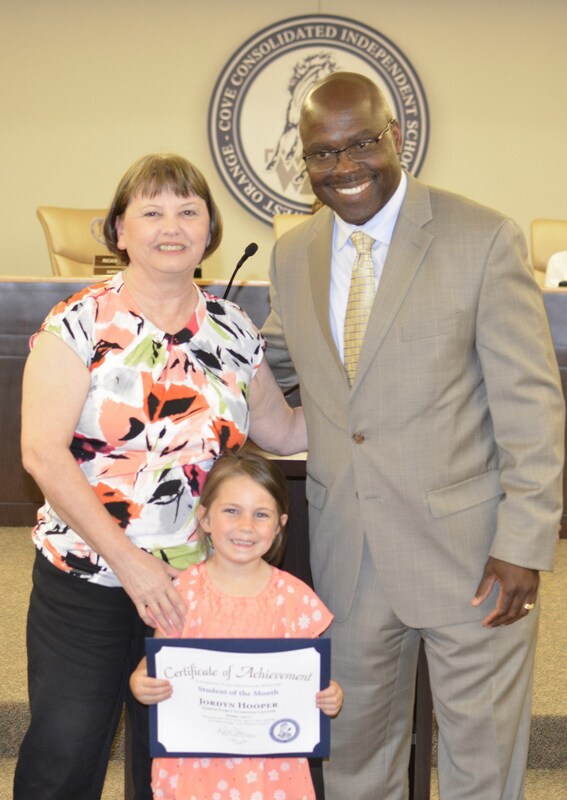 She is pictured with Principal Sherry Hardin and Superintendent Rickie Harris. November 2016: Congratulations to Zachery Nation!! He is a the WOCCISD Student of the Month for November. He is a West Orange - Stark Elementary School fifth grade student of excellent character. He is a member of the Student Council and National Elementary Honor Society. Zachery is kind to everyone and treats classmates and teachers with respect. He is with pictured with Assistant Principal Karl Whitley and Superintendent Rickie Harris. October 2016: Amori Haley is a the WOCCISD Student of the Month for October. Congratulations!! She is a West Orange - Stark Middle School eighth grade student selected by teachers on her campus as a model student. Amori earns great grades and exhibits outstanding classroom performance. Additionally, she is the parliamentarian of the National Junior Honor Society and is a member of the school's performance choir. Amori is currently enrolled in Spanish II and Algebra I, and works as an office aid. She plans to attend Prairie View A & M, Rice, or Harvard to become a surgeon. Amori is pictured with WOS Middle School Principal Dr. Anthony Moten and WOCCISD Superintendent Rickie Harris. September 2016: Congratulations to Kaitlyn Winn! She is a West Orange - Stark High School senior. She was nominated for the honor by her Science teacher, Mr. Washburn. In the nomination, Mr. Washburn writes, "Well-liked and well-respected by both her peers and teachers she consistently exemplifies the leadership qualities that most students only dream of possessing. She has a delightful positive attitude that combines with her strong work ethic to result in a young woman who is a pleasure to know." Additionally, Kaitlyn is enrolled in Advanced Placement courses, is involved in Student Government, and is in the top 20% of her class. Kaitlyn is pictured with WOS High School Principal Rod Anderson and WOCCISD Superintendent Rickie Harris.